Bagheri, A., Bagherifard, A., Saborifard, H., Ahmadi, M., Safarpoor, M. (2014). Effects Drought, Cytokinin and GA3 on Seedling Growth of Basil (Ocimum basilicum). International Journal of Advanced Biological and Biomedical Research, 2(Issue 4 (2)), 489-493. Abbas Bagheri; Aminallah Bagherifard; Hossein Saborifard; Madeh Ahmadi; Mohammad Safarpoor. "Effects Drought, Cytokinin and GA3 on Seedling Growth of Basil (Ocimum basilicum)". 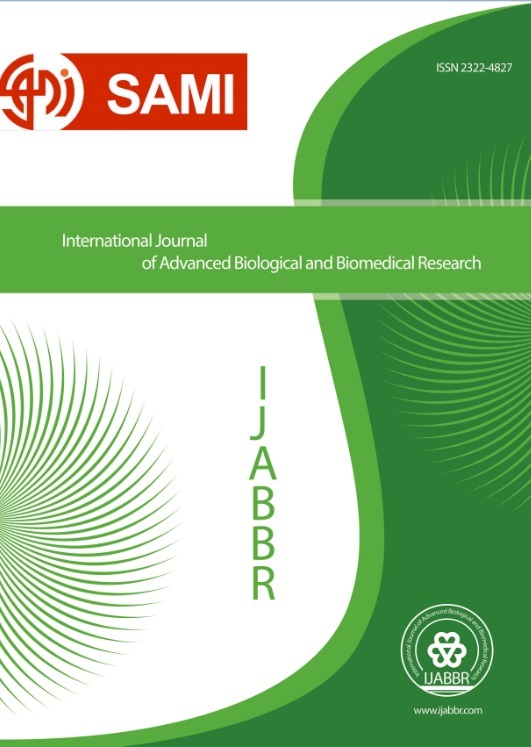 International Journal of Advanced Biological and Biomedical Research, 2, Issue 4 (2), 2014, 489-493. Bagheri, A., Bagherifard, A., Saborifard, H., Ahmadi, M., Safarpoor, M. (2014). 'Effects Drought, Cytokinin and GA3 on Seedling Growth of Basil (Ocimum basilicum)', International Journal of Advanced Biological and Biomedical Research, 2(Issue 4 (2)), pp. 489-493. Bagheri, A., Bagherifard, A., Saborifard, H., Ahmadi, M., Safarpoor, M. Effects Drought, Cytokinin and GA3 on Seedling Growth of Basil (Ocimum basilicum). International Journal of Advanced Biological and Biomedical Research, 2014; 2(Issue 4 (2)): 489-493. 3Department of Plant Production Faculty of Agriculture Nishabur,Mashhad, Iran. 4MSC . Department of Plant Production, Gorgan University of Agricultural Sciences and Natural Resources, Gorgan,Iran. Priming is one of the seed enhancement methods that might be resulted in increased seed performance (germination and emergence), seedling growth and plant yield under stress conditions, such as salinity, temperature and drought stress. In order to evaluate the effect of growth hormones on morphology characteristics and essential oil of basil under drought stress condition, a experiment was conducted at plant research center in Islamic Azad University of Gorgan Branch, Iran, in 2011 year. Experiment was factorial conducted based on CRBD design with 3 replicate in greenhouse. Treatments were include 4 levels priming by growth hormones (control, cytokinin (3%), GA3 (200 ppm) and combinations of hormones for 12 h) and 4 levels of drought stress (D1=100, D2=80, D3=60 and D4=40 percentage of field capacity). Results analysis of variance showed that drought stress had negative significant effects on emergence percentage, morphology characteristics but reduced priming by growth hormones these negative effects. Results of comparing means showed that priming by combinations of hormones had positive significant effects on study factors compared to other seed priming treatments (cytokinin and GA3 ).